Pumpkin: Why is it such a popular treatment for diarrhea? A recent search of the term “pumpkin diarrhea pets” on Google (aka “Dr. Google”) returned more than 485,000 results. Of course I did not check all of them, but the ones on the first few pages extolled the virtues of pumpkin for treating diarrhea, predominantly in dogs and cats. Not surprisingly, I often receive this question, “My dog/cat has diarrhea. Should I give him/her pumpkin as a binder?” Let’s take a closer look at pumpkin, why it is used for management of diarrhea, and whether it might make sense for your companion animal. Before we begin, however, please be aware that if your pet is experiencing diarrhea, a veterinarian should first determine if an underlying medical condition exists. Pets, just like humans, get diarrhea for many reasons; you should first know what you are dealing with before you attempt to manage it. Severe diarrhea can also result in dehydration and loss of electrolytes, potentially serious issues that may require medical intervention such as intravenous fluids and electrolyte balancing solutions to resolve. Once your veterinarian gives the “all-clear” to manage your pet’s diarrhea more naturally, you can consider whether pumpkin is a viable alternative. Have you ever thought about what a pumpkin is – other than something we carve into Jack-O-Lanterns at Halloween or bake into luscious pies at Thanksgiving? Pumpkins are actually a fruit in the squash family. Like many fruits, pumpkins contain high amounts of fiber, which is important to digestive health. Fiber, also referred to as “roughage” or “bulk”, is any part of a plant that cannot be broken down and digested by the body’s enzymes (Mayo Clinic, 2012). Dietary fiber is found in all plant-based foods, including fruits, vegetables, grains, nuts, beans and seeds. There are two types of fiber – soluble and insoluble – and most foods contain a combination of the two. • Soluble fiber: As the name implies, soluble fiber is “soluble”, or breaks down, in water. Soluble fiber absorbs water from the digestive tract, forming a gel-like substance that slows down the digestive process. Soluble fiber is found in foods such as oats, peas, beans, apples, citrus fruits, carrots, barley, psyllium – and pumpkin. As you can see from above, the soluble fiber in pumpkin slows digestion, which is beneficial in the management of diarrhea. And, since it absorbs water, it “bulks” up the stool, helping to control the loose, watery stools characteristic of diarrhea. Clinical studies show that soluble fiber helps regulate stool frequency and consistency in people with Irritable Bowel Syndrome (IBS) (University of Maryland, 2011). While insoluble fiber can benefit those suffering from constipation, it is best to avoid feeding too much insoluble fiber to animals suffering from diarrhea, since it can act as a natural laxative. Opt instead for more soluble fiber, such as that contained in pumpkin. Think that incorporating pumpkin into your pet’s diet will be a hassle? Think again. A good source of pumpkin is as close as the canned food section of your nearest grocery store. Canned pumpkin is an excellent source of dietary fiber, with about 7 grams of fiber in a one-cup serving. Just be sure that pumpkin is the only ingredient; you don’t want any added salt or spices. And be sure not to purchase pumpkin pie mix! Feeding your pet some pumpkin has additional benefits. 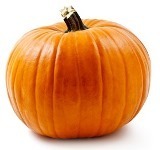 Pumpkin is packed full of nutrients, including beta-carotene, zinc, iron, vitamin A and potassium. And, since fiber provides a feeling of fullness, adding pumpkin to a pudgy pet’s diet may help achieve weight loss by reducing the daily caloric intake (be sure to discuss any diet regimens with your veterinarian to ensure your pet is receiving the proper amount of nutrients). The amount of canned pumpkin you feed will depend upon your pet’s weight. I suggest working up to 1 tablespoon per day for smaller dogs and 2 tablespoons per day for larger dogs. I have received comments from people who tell me that giving their pet too much canned pumpkin actually causes diarrhea. Indeed, consuming too much fiber too fast can cause a myriad of undesirable GI symptoms, including intestinal gas, abdominal bloating and cramping. To avoid these undesirable effects, simply incorporate small amounts of pumpkin slowly to your pet’s diet and work your way up to the suggested dose. This will allow the bacteria in the digestive tract to adjust to the increased fiber. If your dog or cat suffers from mild to moderate diarrhea, and your veterinarian has ruled out a serious underlying medical condition, the soluble fiber found in pumpkin may help relieve the symptoms. Just be sure to introduce it slowly and feed it in moderation. Also, encourage your pet to drink plenty of fresh water. Proper hydration is important in helping soluble fiber do its job.